Playgroups are a great way to meet other mums in Carshalton with children of a similar age. Mums that you meet at playgroups can form a vital support network as your kids grow up and start attending local schools together. Playgroups are ideal places for your kids to socialize. Most groups have a wide selection of age-appropriate toys and messy play activities. Free-play sessions are followed by singing and rhymes.� Importantly, there’s usually a cup of tea on offer too! St Andrews Church runs a Dads and Toddlers group on the first Saturday of�every month. A time for Dad and little one to enjoy some play time, drinks�and biscuits for the children and coffee and bacon sandwich for Dad's. It's�also a time for mum to pop off to the coffee shop with her friends. Working�Mums are also welcome to the toddler group on the Saturday. �Contact Rev Philip for more info 07799265236 or 0208 642 5000. We are a large but friendly group with a wide range of toys and plenty of room to keep your little ones happy all morning. It is a great place to meet other mums, dads, Grandparents and carers. It is our aim to make sure each and every person feels welcome and a real part of the group.�Each week there is a craft activity and music time, where every child gets to sing our special Tiddler's song.�Tea,coffee, squash and biscuits are provided.�Throughout the year we have special events including a Christmas Nativity and party, 'Saturdads', for children and Dads to make Mother's Day cards and presents and weather permitting a summer charity Toddle!�Each week we celebrate children's birthdays.�Unfortunately there is a waiting list so please call the above number if you wish to join or visit. Opening Times: Tuesdays - 9.45am to 11.15am during term time only. We are a fun and friendly group who try to offer something for everyone. We tend to do lots of creative and messy play and we love to sing at the end of the session. So whether you are a mum, dad, grandma, grandad, childminder or nanny you are all welcome to bring your children.�Currently no waiting list, you can just turn up. However we can be busy so operate on a first come first serve basis. 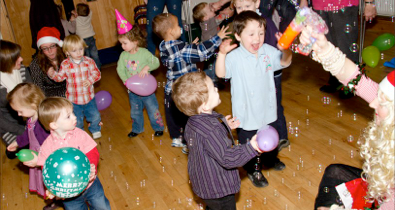 We cater for babies, toddlers and pre-school children. A friendly baby and toddler group in the beautiful grounds of St Andrews church.Lots of toys,singing,messy play and milk and snacks available.All welcome,including grandparents and child minders. Opening Times: Opens at 9.30 am every Friday,term time.Easy to park and open to the community, from babies. There is a waiting list so contact me if you would like to join. Your first time is free then �1.50 thereafter per family. There is craft and toys to play with and parents can have a coffee. Half way through the morning the children sit down and have a drink and biscuit and then we finish off with music and singing. We look forward to seeing you soon. Opening Times: Wednesdays - 9.30am to 11.00am term time only. Age range 0-4 years. We run two toddler groups at St Paul’s with a wide range of activities, including construction, creative play, baby area, home and book corners, a different craft each week, and a time for stories and singing.�Our friendly supportive teams are made up of church members. Come along and enjoy a relaxing cup of tea or coffee, and make new friends whilst your child plays and learns.�Please enter via the Nonsuch Walk entrance. We meet term time only and look forward to meeting you! 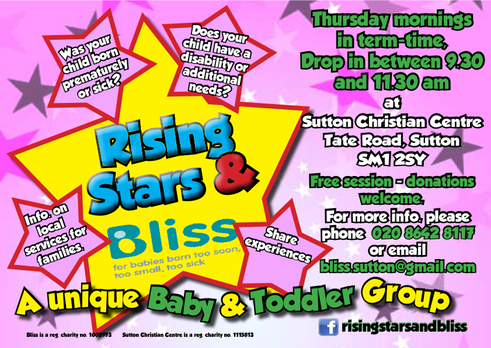 A Baby & Toddler group for premature babies and those with additional needs.